Ever since Star Wars: Episode VII - The Force Awakens debuted in theaters, fans have been eager to see characters like Rey, Finn, BB-8, and Kylo Ren in their favorite games and series. Fantasy Flight Games heard your calls and has read your emails, and has already implemented The Force Awakens into some of their other franchises, including Star Wars: X-Wing. Now the company is debuting a completely new game that utilizes a combination of Dice and Deckbuilding mechanics called Star Wars: Destiny. The new game will not replace their current Star Wars: Living Card Game, but in fact will stand alongside it. Destiny will allow players to pick and choose their favorite characters from their favorite films, and encompasses the prequels, the original trilogy, and the newest entry, The Force Awakens. You'll build your deck with a roster of your choosing, with each character fitting into one of three factions: Force, Command, and Rogue. While you can pick from any era, you will need to choose characters from either the dark or light side, and you can't mix them. As with most dice games, you'll have a certain pool to work with and make the most of the cards in your hand, which will change throughout the game. Your goal is a simple one, that being to take out the opponents team, but the various cards offer multiple opportunities for advanced strategy. 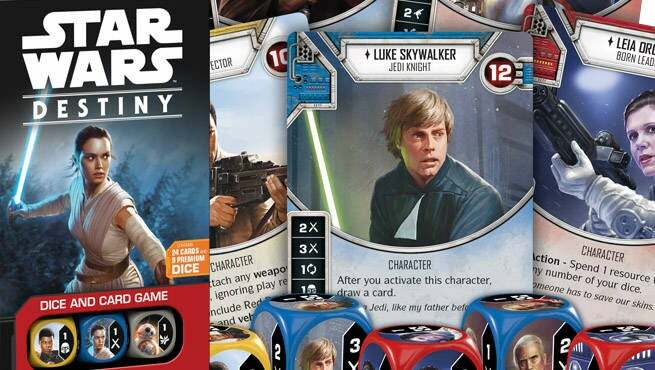 Star Wars: Destiny will be making its debut at Gen Con next week, where attendees can grab two exclusive promo cards which feature Rey and Kylo Ren. The game is expected to release this November. You can more photos of the game in the gallery.